Stubby’s Heroes is a dedicated group of volunteers and advocates who are working to change the negative stigma attached to pit bulls through education and outreach. Stubby’s Heroes encourages participants in the Bully Breed Family Pack Walk to dress up their dogs. Photo courtesy Elizabeth Worthy. Jones County resident Elizabeth Worthy was one of the earliest members of Stubby’s Heroes, joining in metro Atlanta in 2012, and she has brought her passion for pit bull activism with her to Middle Georgia. Stubby’s Heroes was started by founder Johanna Falber. When she joined Stubby’s Heroes, Worthy’s specialty was handling insurance breed discrimination: “We offer to review leases and [insurance] policies for people to be sure that they are allowed to have the dogs, as well as that they have coverage for the dogs. 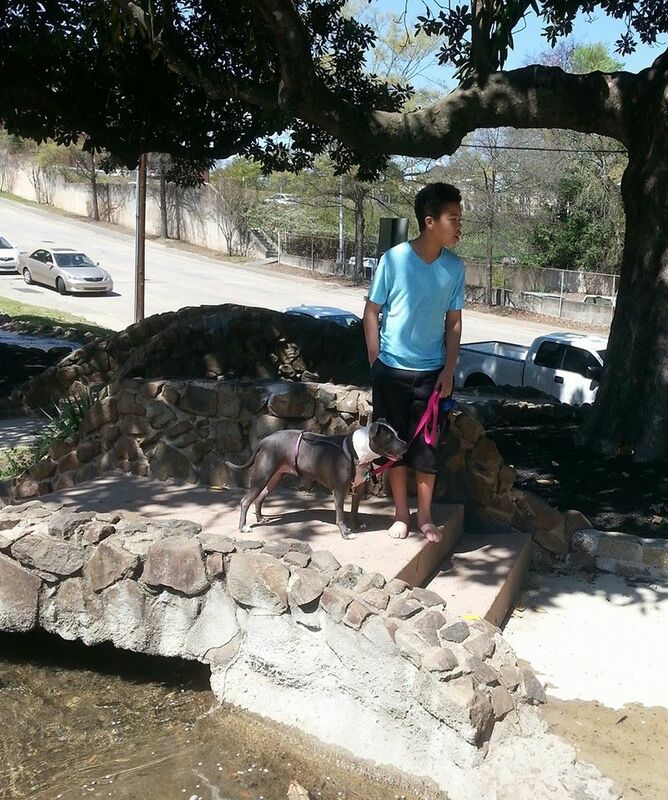 We also refer people to insurance agents and companies that sell pit bull-friendly policies,” Worthy explains. Since 2014, she has been a director of the organization in Macon-Bibb County. Worthy organizes monthly walks for pit bull owners, foster families, and rescuers; she oversees the walks state-wide as well. 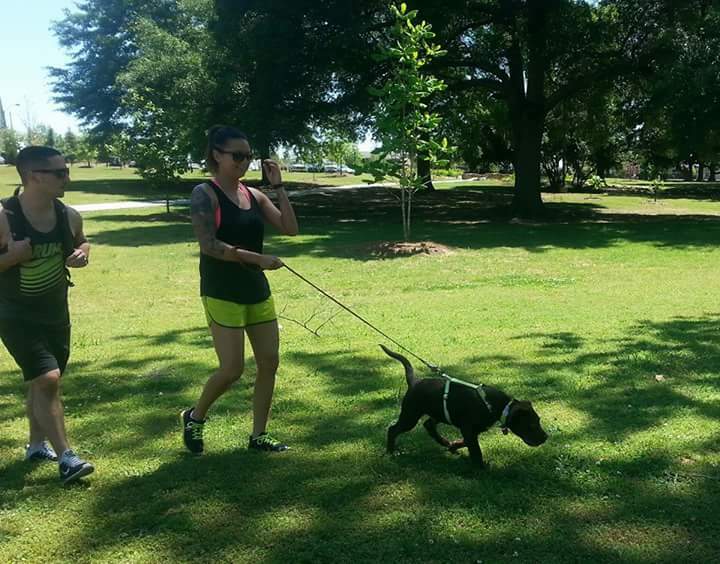 Walks are held in public, dog-friendly spaces, with the goal of socializing dogs with each other, bully breed lovers, and the general public. During the walks, safe spaces are kept between dogs for the safety of all. Photo courtesy Elizabeth Worthy. 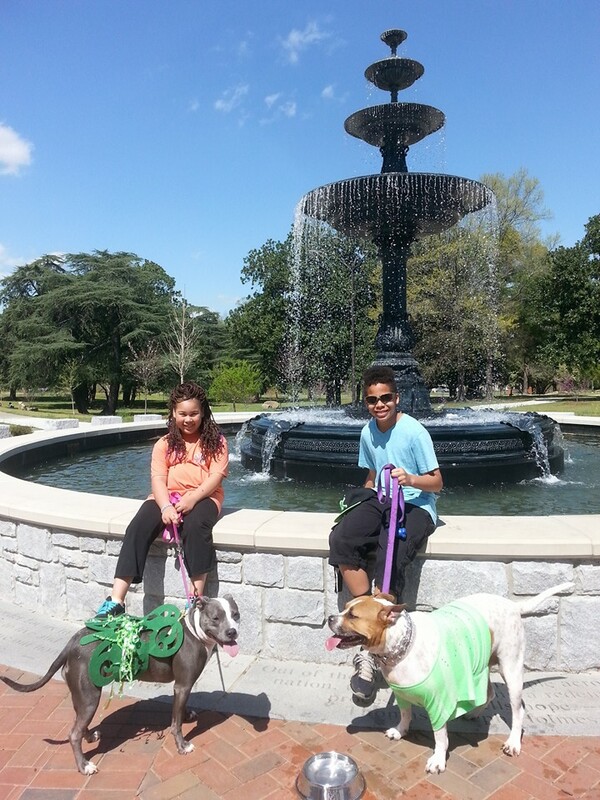 After walking in Tattnall Square Park, the dogs walk over to Washington Park to play in the water. Photo courtesy Elizabeth Worthy. Macon’s bully pride walks begin at Tattnall Square Park, where the dogs and their humans have the chance to walk, run, and mingle with others. On their website, Stubby’s Heroes set out several rules for the safety of dogs and humans during the walks. For example, owners of “reactive” dogs are requested to dress them in red or yellow bandanas so that other participants know these animals need extra space. To learn more about the history of Stubby’s Heroes, and to find chapters in other areas in Georgia, go to their website at http://www.stubbysheroes.org/. *An earlier version of this story incorrectly stated that Elizabeth Worthy was a founding member of Stubby’s Heroes; this was incorrect, as Johanna Falber started the organization and Elizabeth joined in 2012.